Paul and Cori’s Wedding Photos Are Here! 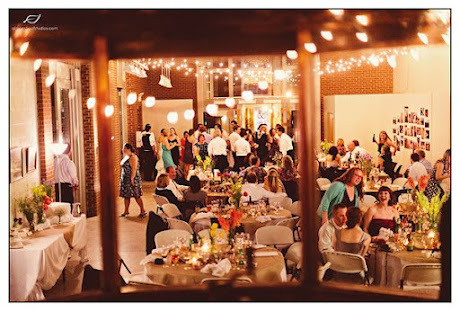 Back in April I coordinated a wedding reception for an uber sweet couple, Paul and Cori. I’ve been waiting anxiously for the photos and they are finally here! 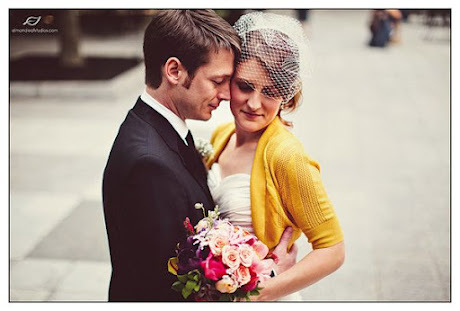 Paul and Cori’s wedding style was funky, rustic, colorful, casual and downright sweet. Here’s a sampling of their photos for your viewing pleasure. The bride’s bouquet was colorful and gorgeous. If you can believe it, all the flowers were from the farmers market and put together by friends of the couple! I think you can get such great deals from the farmers market and a huge variety of flower types. I loved the simplicity of the groomsmen’s boutonniere. Baby’s breath is always so pretty and works perfectly for a rustic themed wedding. This picture is so sweet and I love Cori’s yellow sweater that matched her bridesmaid’s shoes. Here’s a picture of the reception which was held at the Charlotte Trolley Museum. The photo was taken from inside the real trolley in the venue looking out at all the action! You can get a better view of the yellow trolley in the photo on the left. The dessert table (there were two!) had a great burlap bunting that aptly said ” ‘Tis So Sweet.” Similar to the flowers, all the desserts were made by friends of the bride and groom. I loved the generosity of all their friends, I thought it was so sweet. Here’s a collage of the desserts and decor! I’m off to a friends wedding myself this weekend. In addition to seeing a group of great friends, the wedding happens to be back in my college town at Miami University of Ohio, so you know I’ll be hitting up my favorite college dive bars and late night food joints. Bagel & Deli is first on my list, for those of you that are familiar with their steamed bagel deliciousness. Hope you have a great weekend too!